Ted is a member and former General Manager of the Victorian Artists Society. 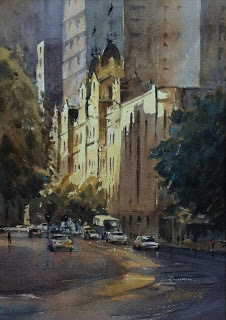 I am also a tutor and member of Hobsons Bay Art Society. He has been a practicing artist for most of his life, being one of the lucky people who managed to combine art with work. Commencing his working career as a ticketwriter and signwriter before moving on to graphic designing and illustration. Ted held a key role as Creative Director and Senior Designer with the State Government of Victoria and the Premiers Private Office before being saught after as Production Manager and Art Director for a leading Victorian Media Company (Starcom Worldwide). 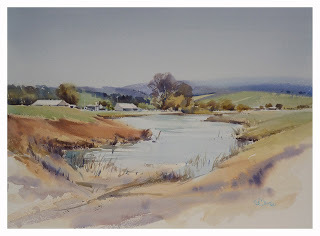 Ted studied watercolours with David Taylor in the early nineties and watercolour has remained his favoured medium since, though he does admit to dragging out the old oils on occasions. 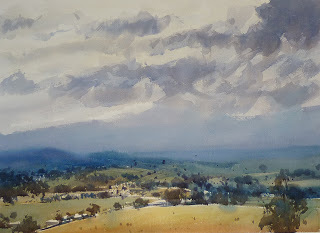 He has had fourteen solo exhibitions since 2000 as well a number of group shows with artist friends including the '5' (Mary Hyde, Julian Bruere, Ray Hewitt, John Hunt and himself), all good friends. Ted believes that this is the most exciting and fun group he has been involved with. Ted was made a Fellow of the Victorian Artists Society in 2011 for his contribution to the Society and Art. He is often called on for workshops, demonstrations and judging.